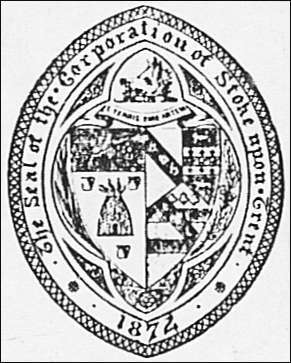 Stoke used the following device as its arms although it never received a grant to use them - of the six towns only Burslem (as the 'Mother' town) had official authority to use arms. 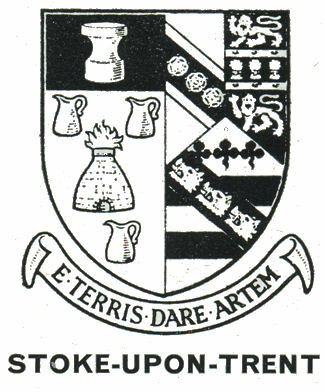 On January 1st 1874 the townships of Penkhull and Boothen were incorporated into the the Borough of Stoke-upon-Trent. Alderman W. Keary was elected first Mayor. 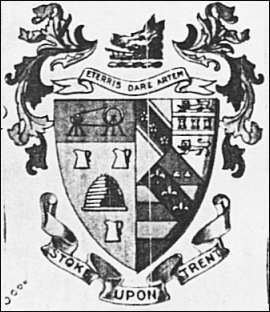 "E terris dare Artem" - "To produce beauty from the earth"
- for the arms of the City of Stoke-on-Trent see here. The shield, divided in the centre contains the potters oven from which flames issue (reminiscent of the early salt glaze methods which required considerable flame). The oven is set between three pottery jugs and above is an illustration of an early potter's wheel. Three roses on a black band are from the Keary arms (the first Mayor of Stoke). Two ermine bars with three 'garbs' (sheaves of wheat) and two tigers for Thomas Minton. Copeland Two red bars on a golden back cloth at the top of which are three green trefoils - over a band with three boars' heads. from the arms of R. P. Copeland. The helm on the Stoke-upon-Trent County Borough Arms is a Boars Head (see example below) this was from the Crest of the arms of Colin Minton Campbell, then the MP for North Staffordshire. The boars head from the Copeland family was incorporated in the city arms.